Since the end of the Cold War, considerable scholarly debates have been devoted to the nature and scope of international state-building interventions in ‘fragile’, post-colonial states and their effectiveness in instituting democratic rule. By examining the construction of political institutions in East Timor, this book highlights the relationship between the social and political realms during these processes. Focusing on the roles of East Timorese leaders and civil society organisations during the independence movement, it analyses the effectiveness of democracy building in East Timor. It examines the processes of drafting the new constitution, establishing key political institutions (such as the electoral system), and articulating a new vision of citizenship and social justice. The book argues that East Timor offers a relatively successful case of democratic transition, enabled by a consistent set of goals and aspirations, grassroots political legitimacy and participation, and the development of a democratic civil nation. 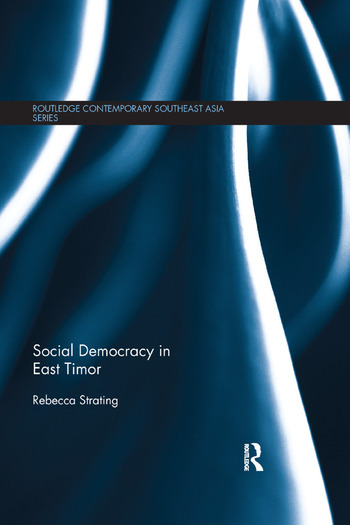 Offering a coherent argument for why democracy has been successful in East Timor and the roles of political leaders and civil society during democratic transition, this book will be of interest to those studying Southeast Asian Politics, International Politics, and Democracy. Rebecca Strating is a lecturer of Politics at La Trobe University Melbourne, Australia. She teaches and researches Southeast Asian Politics and International Relations.